In the depths of Etsy and Pinterest is a fascinating, if tedious, artform. String art, the process of nailing pins in a board and wrapping thread around the perimeter to create shapes and shading, The most popular project in this vein is something like putting the outline of a heart, in string, in the shape of your home state. Something like that, at least. While this artform involves about as much effort as pallet wood furniture, there is an interesting computational aspect of it: you can create images with string art, and doing this is a very, very hard problem to solve with an algorithm. 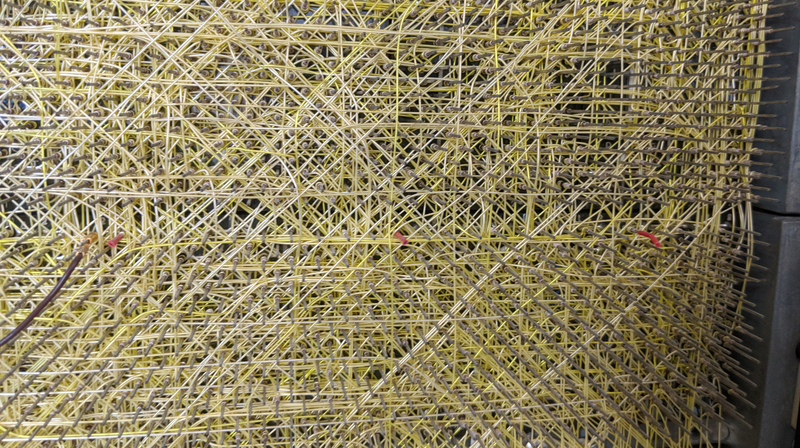 Researchers at TU Wien have brought out the best that string art has to offer. They’ve programmed an industrial robot to create portraits out of string. The experimental setup for this is about as simple as it gets. It’s a circular frame studded with 256 hooks around the perimeter. An industrial robot arm takes a few kilometers of thread winds a piece of string around one of these hooks, then travels to another hook. Repeat that thousands and thousands of times, and you get a portrait of Ada Lovelace or Albert Einstein. The wire wrapped backplane of a DEC PDP-11. This was assembled by a robot that was programmed with an autorouter. It’s also string art. The real trick here is the algorithm that takes an image and translates it into the paths the string will take. This is an NP-hard problem, but it is a surprisingly well-studied problem. The first autorouters — the things you should never trust to route traces between the packages on your PCB — we created for wire wrapped computers. Here, computers would find the shortest path between whatever pins had to be connected together. 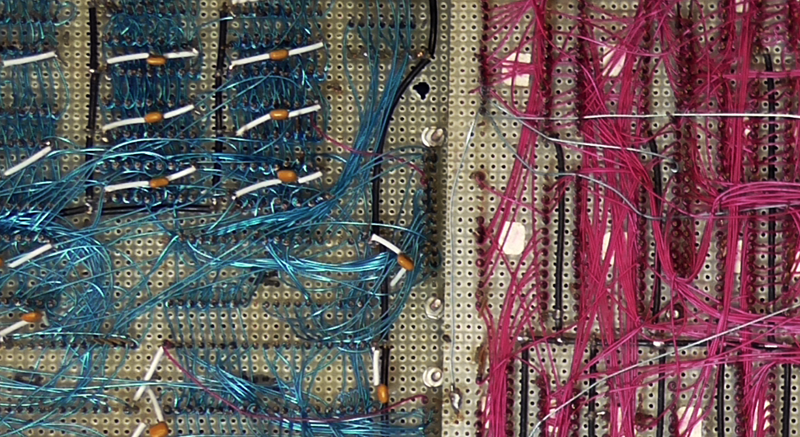 There were, of course, limitations: pins could only have so many connections on them thanks to the nature of wire wrapping, and you couldn’t have one gigantic mass of wires for a parallel bus. The first autorouters were string art algorithms, only in reverse. You can take a look at the complete publication here. You’ll also find prior art (tee-hee) in our own pages. Here is an artist doing it by hand, and here’s a machine to do it for you if you’re lazy. We’ve even seen further work on the underlying algorithm on Hackaday.io. There’s something quite satisfying about building your own computer. Nowadays, constructing your own desktop PC is relatively easy, so if you really want to get your hands dirty, you have to take a step back in time and give some vintage hardware a spin. [YT2095] has spent a good portion of the last two months building a computer based on the classic Z80 CPU. His machine, called “Z Eighty Development” or “ZED” for short is an amazing build, and most definitely a labor of love. He has put an estimated 700+ hours into this machine and it’s a beaut! When closed, the machine is pretty unassuming, but once he folds down the keypad, you can see that all of his time has been put to good use. Most of the board’s components are connected together via wire wrap, including the large 48k memory card he built, as you can see from the link above. The wide array of add on cards all work together to accomplish his goal of “zero overhead” – freeing up the Z80 from having to do any unnecessary processing, such as I/O, etc. It’s quite an impressive build, and ranks up there with some of the best Z80 based computers we have seen through the years. 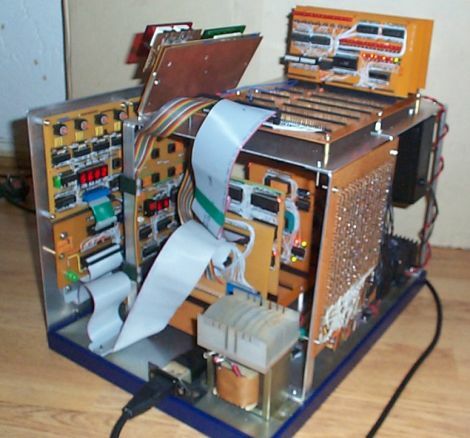 This is Zusie, a computer built out of electromechanical relays. 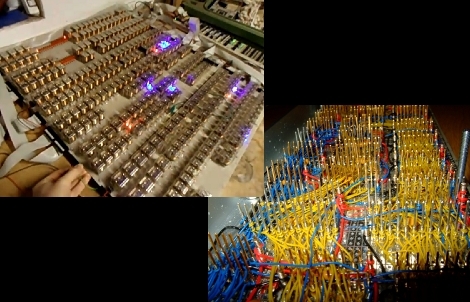 [Fredrik Andersson] picked up a lot of about 100 telephone exchange circuit boards, each with about 16 relays on them. After getting to know a heat gun really well he ended up with 1500 working relays with which to play. The machine runs slowly, it iss noisy, but it definitely works. After the break you can see it running and assembly code program that he wrote. The instruction set is based on boards running microcode. These store the operational commands for each instruction the processor has available to it and they run in parallel with the rest of the operations. We’re always surprised to see that these home-built processors work. Mostly because of the complexity involved in assembling them. How hard is it to find a shorting connection or a malfunctioning relay? Those problems aren’t limited to this application either, what do you do if a transistor-logic CPU has a malfunctioning chip?